The Second 'Captain Marvel' Trailer Is Here, And It Is Glorious! Wow...I'd really hate to be Thanos right about now. During halftime on Thursday Night Football we got the second trailer for Marvel's upcoming 'Captain Marvel' which we've all been dying for more of since we first saw that logo show up on Nick Fury's pager at the end of Infinity War. Seeing as those not into the source comics had/have little to no idea who Carol Danvers aka Captain Marvel is, it was a little surprising that they went so light on the overall picture in the first trailer using that opportunity to setup the time period (what's up 90's!) and show off their de-aging process with Nick Fury and Phil Coulson. Well, if you were one of those folks who were still wondering what was so special about the first lady of Marvel, you have your answer. **Bonus points for turning her comic's Mohawk look into a cool feature of her suit. 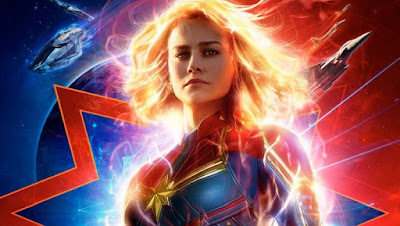 Check it out below and look for Captain Marvel in theaters this March.